Place the flour, eggs and breadcrumbs in 3 separate bowls. Dust the fish with the flour, dip into the egg and press into the crumbs. Heat 1cm oil in a large frying pan over medium heat. Cook the fish, in batches, for 2–3 minutes, turning halfway, or until the fish is golden and cooked through. Drain on paper towel. 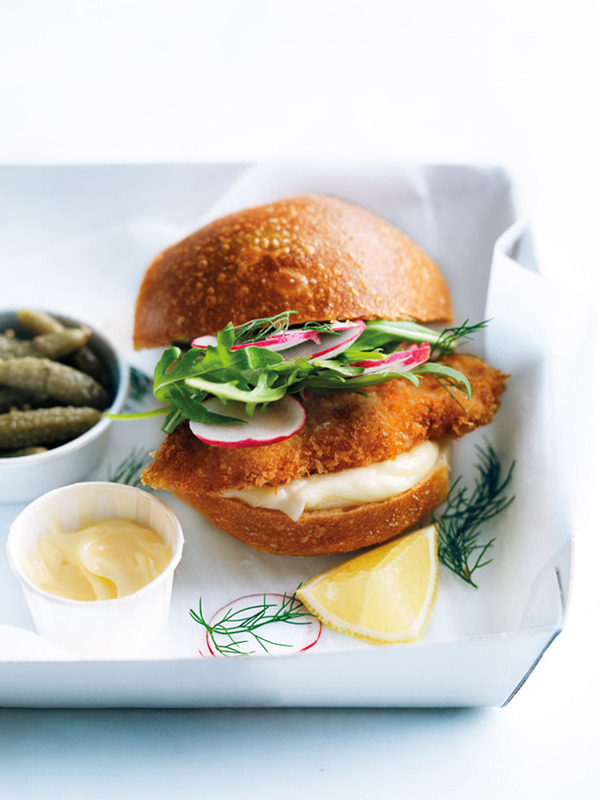 Spread the rolls with mayonnaise and top each with 3 pieces of the fish, radish, rocket and dill. Serve with the cornichons and lemon wedges. Serves 4. + Japanese panko breadcrumbs are made from crustless white bread. Find them in Asian grocery stores and the Asian section of the supermarket.